Born in Brooklyn, NY, Dr. Ami Sheth has been living in the Bay Area since 1991. After finishing high school in Palo Alto, she attended the University of California at Berkeley. Later, she received her doctorate with honors from the California College of Podiatric Medicine in San Francisco. Dr. Sheth spent a year in Washington State where she trained at the Madigan Army Medical Center before returning to California to complete her 3 year Podiatric Surgical Residency at Kaiser Foundation Hospital in Vallejo. Her training included childhood ailments, trauma, sports medicine, and surgery. She is most interested in treating children with foot disorders. She has been in practice since 2005 and is a Diplomate for the American Board of Podiatric Surgery. She is also a Fellow with the American College of Foot and Ankle Surgeons. Dr. Sheth is very active in organized medicine, being a Past President for the Santa Clara Valley Podiatric Medical Society and the California Podiatric Medical Association. She is also involved at the national level in the American Podiatric Medical Association. Believing in all aspects of taking care of people, she has been a strong legislative advocate for patient and health care access issues for many years speaking with both our state and federal representatives. Mentoring and “paying it forward” has been something Dr. Sheth values. She is a UC Berkeley alumna and is active with the California Alumni Association where she is a resource for undergraduate students from UC Berkeley. 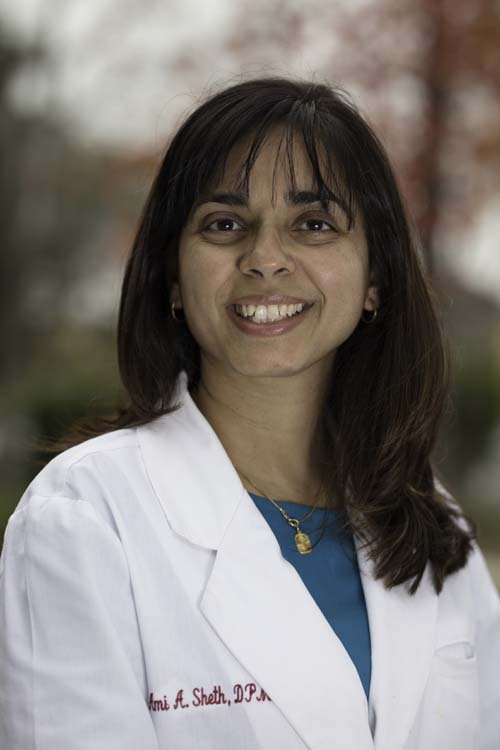 Dr. Sheth is also part of a Podiatric Medicine mentoring network, offering her time and expertise to students interested in exploring the field. Her outside interests include volunteering at her son’s elementary school, making it to Orange Theory Fitness classes, and exploring new hiking trails. She is a Pintrest addict and is busy attempting multiple projects. Serviced 400 patients per resident per year in a weekly resident-run Fracture Clinic by devising treatment plans for acute foot and ankle trauma and assessing the progress of non-surgical patients during their subsequent appointments. Participated in over 1000 surgical podiatric procedures. Performed skin-to-skin procedures with attending surgeon for biweekly operating room block time. Determined progress of 450 patients per resident per year in weekly resident-run post-operative clinic consisting of follow-up appointments for surgical patients during their entire post-operative course. Executed wound care debridement and assessed patients for infections during weekly resident-run podiatric wound-care clinic of 400 outpatients seen per resident per year. Managed podiatric aspect of limb salvage with both primary care physicians for diabetes management and with vascular surgery to develop long-term treatment strategies. Examined and treat new and returning adult patients with podiatric medical conditions. Performed history and physical examinations and educated surgical patients on their peri-operative courses. Collaborated with primary care providers for preventative health maintenance. Serviced 300 pediatric patients seen per resident per year in resident pediatric clinics consisting of biomechanical correction of non-surgical podiatric conditions. Determined need for serial casting for conditions such as clubfoot, metatarsus adductus, and calcaneal valgus in neonates and infants. Worked with other medical services, including Vascular Surgery, Internal Medicine, and Infectious Disease services to devise hospital course and develop long-term health maintenance plan. Average number of new inpatients to be followed by the podiatry service while in the hospital per year: 170 patients. Advanced knowledge of Gujarati and conversational knowledge of Hindi. I enjoy Indian dancing, snowboarding, and learning how to cook. Plastic reconstruction for skin defects (Gray Williams, DPM, Kaiser Permanente) 7/04 Poster presentation, not completed. Non-small cell carcinoma: primary source in the foot (Nizar Kajani, MD, Kaiser Permanente) 8/03 Case study not re-submitted for peer review. Soft tissue neoplasm occurrences in the foot and ankle (Gray Williams, DPM, Kaiser Permanente) 7/03 Original prospective research, not completed. The effects of smoking on wound healing (Jeffery Page, DPM, CCPM) 2/01 Presenter, Student Research Symposium. American College of Foot and Ankle Surgeons Conference, New Orleans, LA. The attachment process as observed in day care children (UC Berkeley) Spring 1998 Publication in Active Intellect: Undergraduate Research Journal.